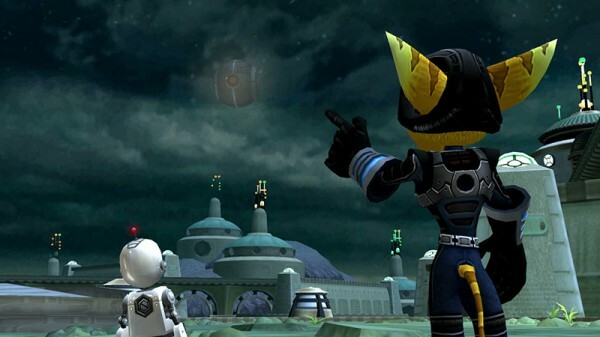 I first experienced the Ratchet & Clank series in the shape of Tools of Destruction, the first and (according to Metacritic) best last gen outing for the bot and Lombax duo. That these guys are up there with Jak & Daxter, Sly Cooper and the rest of the PlayStation mob is without question, but they have faltered a little of late. Happily the series is in for some serious attention in the coming year, with Insomniac prepping a Ratchet & Clank movie and a PS4 reimagining of the original game. Tiding us over until then is this HD remaster of the first three games, appearing on the Vita for the first time two years after the release of the PS3 version (review here). 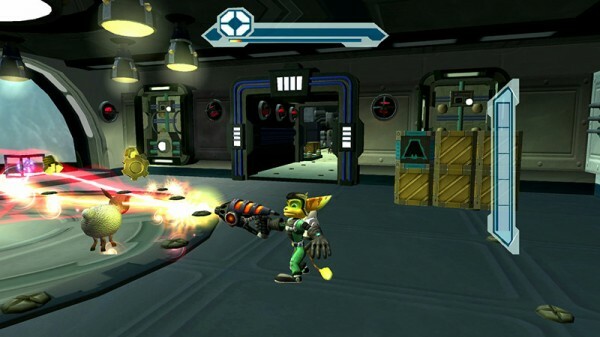 I had never played the Ratchet & Clank originals before so there is still a fresh audience left for the handheld release, but the main drive is doubtlessley to give fans who’ve already played the games the option to take things on the go. It’s a given that the games are high quality doses of zany fun. The titular duo avoid the perils of being irritating loudmouths, and some of the jokes have a surprising bent toward cynical social commentary (“why are you not escaping on a fancy ship?” Ratchet asks a maintenance worker robot, “socio-economic disparity” is the deadpan reply). The plot throughout the trilogy is your standard save the galaxy from evil fare, but the characters and the humor surpass that basic framework to create a joyful universe full of strange creatures and memorable weirdos. The humour is goofy with the odd drop of the satirical, and the characters get a decent bit of development throughout the trilogy. This is a classic set of games and the vast majority of players will know what to expect; planet hopping, Bolt collecting, and enemy bashing are the name of the day, with a few other mechanics thrown in every now and again to mix things up. 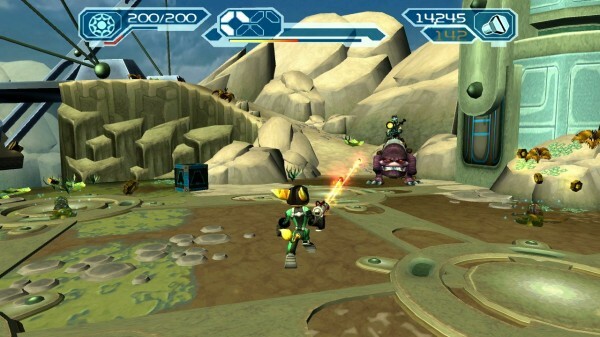 What has always sold Ratchet & Clank to me however is the weapons, which start off wacky and develop from there. The shooting mechanics blend well with the platforming, and although the first game feels a bit off due to the lack of strafing, it’s still a blast to play. Ratchet has his OmniWrench to give things a decent smack around the head, but why use such a mundane weapon when you can turn your enemies into explosive black sheep? 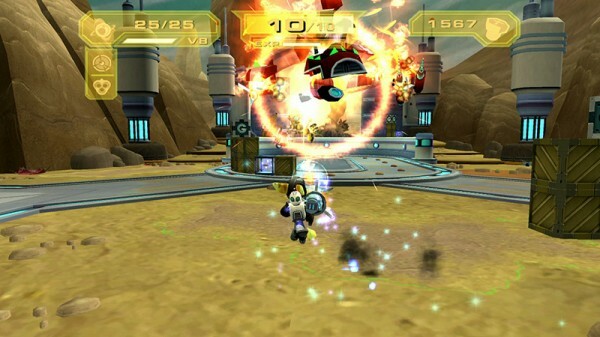 That particular gem only appears in game two, but there is plenty of fun to be had with the selection of flame throwing, exploding, zapping, missile launching mayhem causers throughout the trilogy. Collecting Bolts is a breeze when you know they’ll get you that next weapon, and the constant barrage of new stuff keeps the gameplay ticking along. The platforming is tight and enjoyable, and bar the occasional mishap with the camera and a bit of backtracking in the first game, forms a solid backbone for the action. As you would expect things evolve as the series continues, with more abilities, mini games and RPG elements popping up to add more depth to an already fine experience. Crucially weapons can be leveled up from the second game, Going Commando, expanding their firepower or tweaking their effects. The upgrades are limited to a single step, but the whole thing blossoms in Up Your Arsenal to allow for multiple upgrade levels. The games are fantastic examples of their time and still hold up well in terms of gameplay, with sessions easily sapping hours at a time. Players used to more recent releases may stumble a little on the more basic move set of the first game, but it’s still great fun to explore the roots of the franchise and watch everything grow. One of the first things to do when booting up the game is to jump into the options menu and tweak the volume levels of the music and sound effects. For some reason the effects dominate the soundscape at the default settings, making the chinking collection of Bolts about the only thing you’ll hear if you don’t give the sliders a push. That easily fixable grumble aside, the game is otherwise a solid HD remaster that impresses with its vibrant colours, world and character design rather than its resolution. It looks good, and the cartoon art style on even the first game survives well, but there are a few rough edges to the presentation that make it far from a perfect port. The music and effects can be a bit glitchy at times, and the input lag in the first game, although slight, is a bit of a kick in the head when trying to get in to the trilogy. 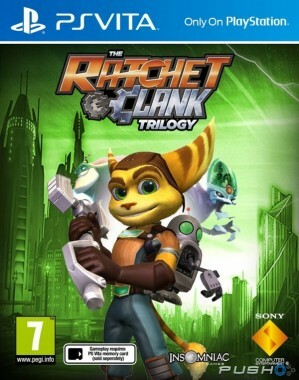 The Vita version of this collection is a bit of a non event given that the PS3 version showed off the games in HD two years ago, and the fact that the whole lot are cross buy but not cross save makes the Vita version a tough sell unless you’re dead set on playing Ratchet & Clank on the go. If that does happen to be your greatest desire then you’re in luck- The Ratchet & Clank Trilogy delivers great gameplay with a shiny if imperfect coat. Playing through these three games will be a joy for anyone who has missed out on them, and the combination of comedy, character and over the top weaponry makes for a lot of breezy fun. Ratchet & Clank emerged in a generation of numerous classics of the same pedigree, but for me they have the jump on Jak & Daxter any day.